This art show displays a variety of works done by members of the Hopkins community who, through a collection of diverse forms, have chosen to depict what identity, self reflection, and individuality mean to them. To prompt submissions, the Art Department and Student Diversity Board asked members to consider how a community might affect the construction of an identity. The pieces produced in response represent media such as photography, sculpture, paintings, and graphic novels. 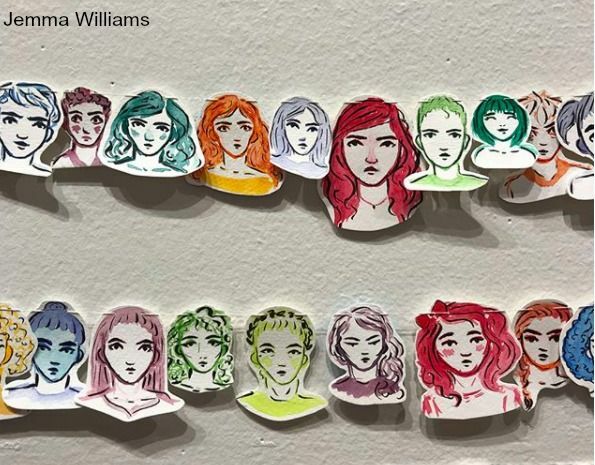 Ana Sotelo-Emery’s ’18 piece above was inspired by individual people at Hopkins, who, when strung together in their paper forms, created a group in which everyone could identify with a face or person. She began with this piece as a casual project, and after hearing about the theme of the art show, she decided to take it further. Now Sotelo-Emery has even added her own portrait to the line of faces. The art show held its opening reception on November 3, 2017 and will close on January 5, 2018.